Balboa Park December Nights is as close as San Diego gets to becoming a winter wonderland, and this year’s event promises to be bigger and better than ever. San Diego’s largest free festival, which is designed to be the city’s holiday gift to the community, is expected to draw at least 300,000 in this its 35th year. The two-day celebration of entertainment, food and fun, takes place Friday, Dec. 6, from 3–11 p.m., and Saturday, Dec. 7, from noon–11 p.m. Balboa Park is decked in twinkling lights and silvery garlands. Fanciful Christmas trees abound, and the aromas of multi-cultural holiday treats waft through the air. In the spirit of the season, participating park museums open their doors to the public free of charge from 5–9 p.m. both evenings. Many present special holiday programs. Kids will be awed by the elaborate gingerbread constructions at the Mingei International Museum and can join in holiday-inspired craft projects at the San Diego Air & Space Museum. All ages will be enthralled by the amazing handbell ringers who perform at the San Diego History Center, and don’t miss the San Diego Floral Association’s exhibit at the House of Hospitality of 30 beautifully decorated holiday trees. Festive performances take place on the beautiful stage of the Organ Pavilion. Festivities are family friendly, multi-cultural and staged throughout the park. The San Diego Civic Youth Ballet will perform excerpts from “The Nutcracker” on the Casa del Prado Stage. Steps away on the California Quadrangle near the San Diego Museum of Man, revelers can see the Santa Lucia Procession and children’s choir performances. The San Diego Civic Dance Company will present Rockettes-style routines, while a puppet version of “The Christmas Carol” will be presented at the Marie Hitchcock Puppet Theater. African drumming and dance performances and Reggae music performances are planned at the WorldBeat Center. Dozens of singers, dancers and musicians will take to the stage at the Organ Pavilion. Kids can get their photo taken with the Grinch at the Old Globe. Youngsters will have the opportunity to visit with Santa as he strolls the park, and they can pose for a photo in the Old Globe courtyard with Dr. Seuss’s Grinch who stole Christmas. Kids of all ages can join with Junior Theatre students singing holiday songs. A series of children’s holiday movies will run nonstop both evenings in the theater at the Hall of Champions. There also are plenty of carnival rides to keep the younger set entertained. Hungry? December Nights is known for its mouth-watering range of food and drink offerings. The House of Pacific Relations International Cottages offer traditional holiday foods from a smorgasbord of nations: think empanadas, egg rolls, shepherd’s pie, pasties, pancit, samosas, plantains, pierogi, bourekas, baklava, paella, and even blueberry soup. Many museums offer tasty treats as well. You’ll find roasted chestnuts at the San Diego Art Institute, yakisoba at the Japanese Friendship Garden and hot toddies at the Hall of Champions. In addition, numerous food vendors sell an array of yummy holiday delights, from melted Swiss raclette to fresh-baked gingerbread cookies. The 21+ set can sip a locally crafted brew at one of several beer gardens. Ethnic food specialties are part of the delicious fun at December Nights. December Nights are prime time for holiday shopping. Find great gifts at museum stores, from Spanish Village artisans and at a wide range of arts and crafts booths. For $300 or less, buy a piece of original art right off the walls at the San Diego Art Institute. And don’t forget to buy a sprig of locally sourced mistletoe from San Diego Natural History Museum Canyoneers. With so many attending December Nights, parking can be tougher than fitting down a chimney. Your best bet is to take public transportation or park for $5 at Petco Park or for free at City College. Free shuttles will ferry celebrants to and from 6th & Laurel from 3 p.m.–midnight on Friday and from 11:30 a.m.–midnight on Saturday. Finally, be sure to bundle up! While San Diego may better known for sandmen than snowmen, it can get downright chilly here on December nights. What’s your favorite part of December Nights in Balboa Park? Let us know in the comments. 1. 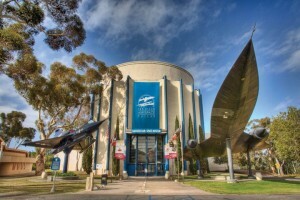 Meet an Astronaut: On Friday, August 26, the San Diego Air & Space Museum is offering a special opportunity to meet Al Worden, command module pilot for the Apollo 15 mission to the moon in 1971. Worden will give a talk relating his fascinating moon-travel experiences, and sign copies of his new book Falling To Earth: An Apollo 15 Astronaut’s Journey to the Moon. 2. 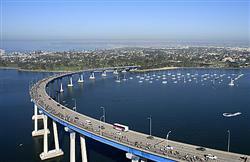 Ride the Bridge-Bike the Bay: On Sunday, August 28th, take advantage of a rare opportunity to ride over the iconic San Diego-Coronado Bridge. This popular, noncompetitive 25-mile ride along Bayshore Bikeway passes through the cities of Coronado, San Diego, Imperial Beach, Chula Vista and National City. Registration is required. 3. Julian Star Fest: Professionals and amateur enthusiasts explore the world of astonomy during this four-day festival from August 25-28. 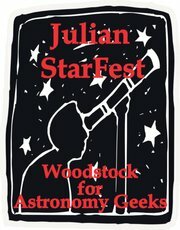 The festival takes place at Julian’s Menghini Winery and will include exhibition areas, guest speakers and an astronomy equipment swap meet. 4. Sleeping Beauty Wakes, La Jolla Playhouse: Extended through this weekend is the popular Sleeping Beauty Wakes. The story follows the characters after a father brings his sleeping daughter in to a sleep disorder clinic, staff and patients mysteriously find themselves sharing the same dream. With beguiling characters, hypnotic lyrics, and a rocking score from GrooveLily, this musical about a father, a daughter and an unlikely suitor dives into the magical space between dreaming and waking. 5. 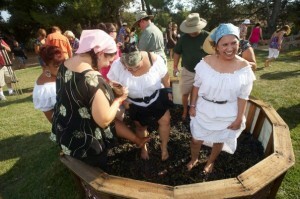 Orfila Grape Stomp: When their fruit is harvested in late August, Orfila Vineyards and Winery in Escondido hosts this fun-filled event so guests can help stomp the grapes and enjoy great food, live music and tractor rides through the vineyards. I had the pleasure of attending a sneak preview of the San Diego Air & Space Museum’s new exhibit, The Science of…Aliens, last week. Now being a self-proclaimed sci-fi lover, I was all over this invitation as soon as I got it. What would the Air & Space Museum’s take on this hotly contested topic be? I was thrilled to see that the Air & Space Museum did their usual great job of putting together an exhibit that blends science and pop culture into a fun, educational time. They’ve brought in some fun, atypical exhibits over the past several years and Aliens definitely doesn’t disappoint! From the cool technology mapping out what life on an alien planet might look like, to the section of Pop Culture artifacts chronicling our society’s fascination for all things “alien”, this exhibit was full of fun facts and laughs. 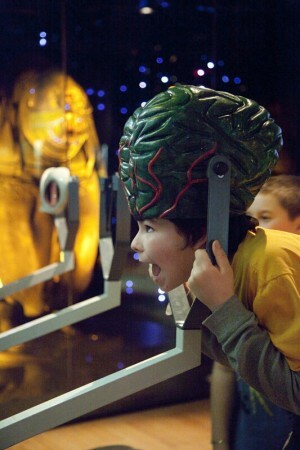 The exhibit is great for science and science fiction buffs alike! A fun interactive exhibit for kids of all ages!